Nooshin Rostami's practice navigates two distinct states of solid and fluid in its core. She works with controlled systems of structures using varied materials and processes. Their construction brings a series of mutable and spontaneous gestures that negotiate the relationship between stability and uncertainty. The mechanical part of her work is often expressed through geometric forms where she measures tangible and abstract spaces. This geometry is liquified and broken down by uncontrollable and fluid means such as light, reflection, movement, and negative space. Through a multitude of techniques and mediums, she investigate bygone days of growing up in Iran, immigration to the United States and navigating exile. In an attempt to decipher her diasporic identity, she is driven to reexamine her upbringing, speculate on possible futures, and seek a fleeting balance within this complex state of in-betweenness. The narratives she wishes to communicate determine the medium she chooses to work in. Her process oftentimes begins with a thinking space where a series of drawings or abstract paintings morphs into other mediums as themes and narratives emerge. 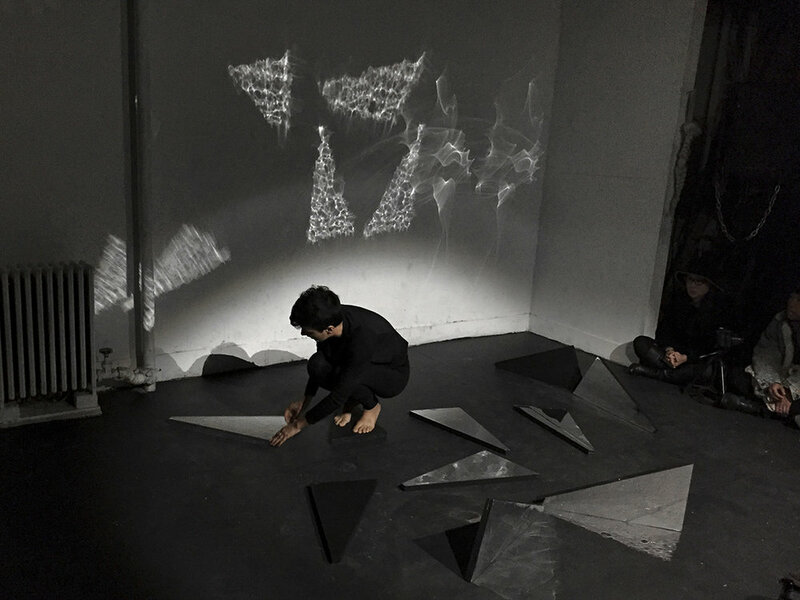 A consistent undercurrent shaping her practice therefore involves mapping the fine lines between seemingly paradoxical notions such as human versus machine, static versus fluid and stability versus uncertainty. Rostami navigates the scope between these binaries in order to arrive at exciting new amalgams.